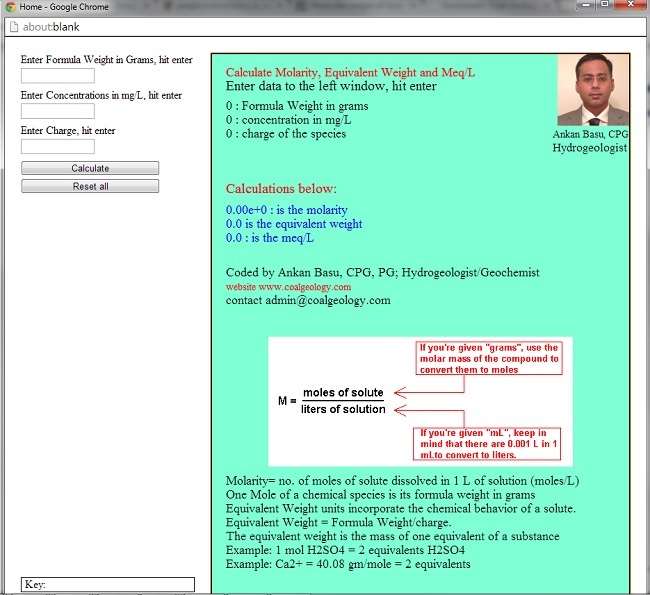 I am going to talk about molarity (moles/L) , mili-equivalent/L and equivalent weight today. My approach is to get you what you need from common geochemical analysis report from various labs in the US. In general, when you analyze for quality, depending on the lab and the parameters of interest, you may use units such as ppm, ppm or mg/L ug/L. Although in theory, ppm is not exactly the same as mg/L, we will assure that they are for all practical mathematical calculations. Similarly, we will assume, ppb is same as ug/L. If you look closely, you can tell that some of the units are actually dimensionless ratios: ppm, ppb, ppt (parts per million, billion, and trillion). Some units are weight per volume units, such as milligrams per liter (mg/L) and micrograms per liter (ug/L). Now let’s look at molarity. Molarity is the number of moles of solute dissolved in one liter of solution (moles/L). The units, therefore are moles per liter, specifically it’s moles of solute per liter of solution. Example: NaCl = Na (Atomic Mass =22.991) + Cl (Atomic Msss= 35.457) = 58.448 gm. Thus, a 1 molar solution of NaCl would be 58.5 grams of NaCl dissolved in 1 Liter of water. Remember that molality (M) = moles solute / kg of solution; we are NOT going to discuss about this one today. The equivalent weight of a dissolved ionic chemical species is the formula weight divided by the electrical charge. Or, one equivalent is the amount of ion required to cancel out the electrical charge of an oppositely charged monovalent ion. Generally, the amount of a substance in equivalents often has a very small magnitude, so milliequivalents (mEq or meq) is commonly used instead. In fact, in out python GUI you can calculate milliequivalents of solute per liter of solvent (mEq/L). Just enter the data to the left window and hit calculate.